A New York Police Department officer has been indicted on criminal charges by a grand jury for fatally shooting an unarmed Brooklyn man in the stairwell of a local apartment complex. After less than a week of hearing the case, the grand jury indicted rookie officer Peter Liang on charges that could send him to prison for up to 15 years for the death of 28-year-old Akai Gurley. Liang, 27, was charged with second-degree manslaughter, reckless endangerment, second-degree assault, and official misconduct. Liang is expected to turn himself in on Wednesday ahead of his arraignment in Brooklyn Supreme Court. A spokeswoman for the Brooklyn District Attorney declined to comment. “I’m glad the grand jury looked at the evidence and returned an indictment,” Kimberly Ballinger, Gurley’s domestic partner and the mother of his two-year-old daughter, told New York Daily News. Ballinger plans to sue New York City for $50 million over Gurley’s death. On November 20, Liang discharged one bullet when patrolling the unlit stairway of a Brooklyn housing project, striking unarmed Gurley in the chest as the man stood in the landing a floor below. Liang, on the force for less than 18 months, was allegedly holding a flashlight in his right hand and his 9-mm Glock in his left, which he was using to open a door when the gun fired. Liang said he fired the gun accidentally. In the wake of the shooting, the Daily News reported that Liang and his partner did not answer the radio in the six minutes right after the shooting, but instead texted their union delegates. Gurley’s death was ruled a homicide by the medical examiner’s office. 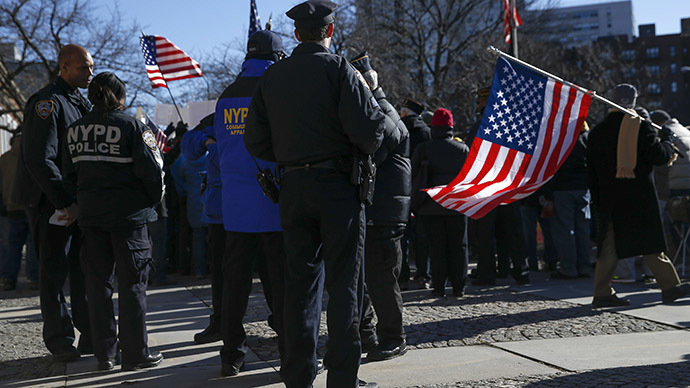 Patrick Lynch, president of the Patrolmen's Benevolent Association, called for due process. “The fact that he was assigned to patrol one of the most dangerous housing projects in New York City must be considered among the circumstances of this tragic accident,” Lynch told the New York Daily News. The grand jury started hearing the case on February 4 before delivering Tuesday’s indictment. The panel heard evidence for a few days and did not ask Liang to take the stand, but did hear from Gurley’s girlfriend, Ballinger, who was with him when he was shot. The decision comes in stark contrast to other recent grand jury decisions that took months to unfold and involved dozens of witnesses. In the cases of Michael Brown in Missouri and Eric Garner in New York, no indictments were handed down. This indictment, however, is the latest attained by Brooklyn District Attorney Kenneth Thompson, who in recent months obtained indictments against three other police officers.